Get excited people, Melbourne BeerFest is returning to Catani Gardens in March. Over 300 unique, exotic and small batch craft beers, ciders, cocktails and wines, hand crafted and perfectly complemented by Melbourne’s most decadent local street food. Brewmanity will be setting up a Big Freeze zone at this year’s St Kilda BeerFest, and together with Beerfest Australia have released 50 special tickets to get fundraising started. 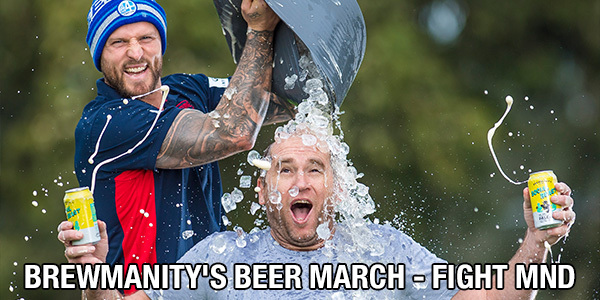 For a $50 donation, you’ll get entry to the festival – featuring Sneaky Sound System - 5 free Brewmanity beers, and the opportunity to dunk Brewmanity Founder, David Neitz, into a freezing pool of ice! With 100% of the ticket price to be donated to the Fight MND foundation, thanks to Beerfest AU and Brewmanity, there’s nothing more to do than get your Beerfest on! These 'Beer March to Fight MND - Charity Ticket' tickets are available via eventbrite and as mentioned above include entry to the festival with 5 free beers at the Brewmanity stall. All proceeds (minus booking fee) of this ticket will go to the Fight MND foundation. A wristband allowing drink purchases/ consumption is only given to people 18+. There's $10 admission for ages 14-17 with under 14 been free. Under 18's must accompany an adult.